River Seine swells to maximum of 5.84 metres as city remains on high alert. 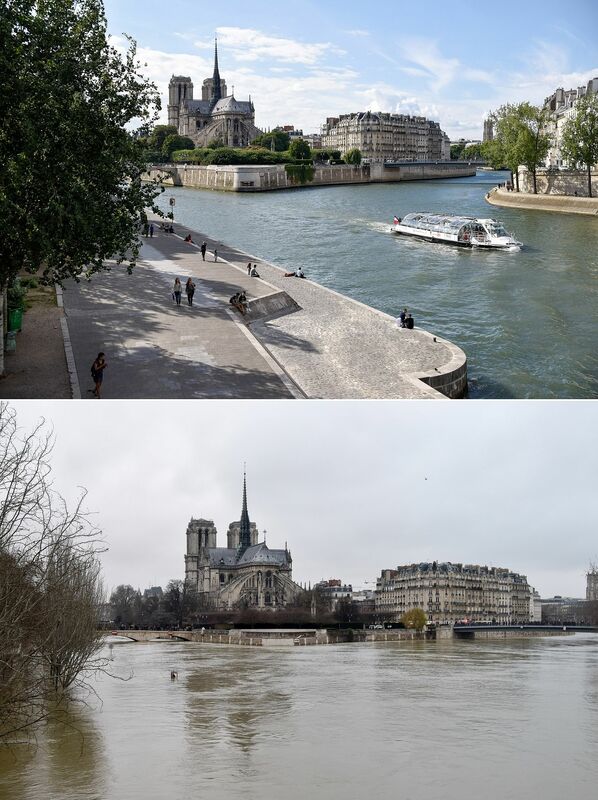 PARIS • The swollen Seine reached its highest level yesterday at more than 4m above normal, leaving a lengthy mop-up job for Parisians after days of rising waters that have put the soggy city on alert. The river rose to 5.84m early yesterday, causing continued head-aches for commuters as well as people living near its overflo-wing banks. The Vigicrues flooding watchdog said the river would stay at its current level throughout the day before beginning to recede today. Around 1,500 people have been evacuated from their homes in the greater Paris region, according to the police, while a similar number of homes remain without electricity supply. Tourists also suffered, with the capital's famous Bateaux Mouches rivercraft out of service, and only emergency services authorised to navigate the waterway. The Seine did not quite reach the 2016 high of 6.1m, when priceless artworks had to be evacuated from the Louvre. But the world's most visited museum was still on alert on Sunday, along with the Musee d'Orsay and Orangerie galleries, with the lower level of the Louvre's Islamic arts wing closed to visitors at least until yesterday. "Fluctuat nec mergitur (tossed but not sunk) but it is cold," the Zouave statue tweeted from an account set up in its name by an anonymous admirer, using the Latin motto of the City of Paris. Police again warned flooding aficionados against bathing or canoeing in the river, saying that it was "forbidden and extremely dangerous". More favourable weather is expected for the week ahead, but even once the water levels start to recede, forecasters and officials say it will be a slow process, as much of the ground in northern France is already waterlogged. "If we are talking about things getting completely back to normal, that is going to take weeks," said Mr Jerome Goellner, regional head of environmental services. The December to January period is now the third wettest on record since data collection began in 1900, according to France's meteorological service. A main commuter line, the RER C, has halted service at Paris stops until at least next Monday, and some expressways that run alongside the Seine have been closed. However, fears of flooding like that seen in 1910, which saw the Seine rise to 8.62m and shut down much of Paris's basic infrastructure, appeared to be unfounded. But several areas on the city's outskirts were under water, including the southern suburb of Villeneuve-Saint-Georges, where some residents were getting around by boat and dozens have been evacuated from their homes. "Everyone is getting around by boat" on the island of Migneaux in Poissy, a western Paris suburb, said local resident Serge Matikhin. "The mood is still good, we are used to it - in 20 years, we are on our eighth or ninth flood," he said.